I Am Ashamed – We Need A Better Dairy! I was so disturbed by this video that I started talking to dairy farmers. Call me naive, but I actually had NO IDEA calves were taken from their mothers right after birth! Somehow, I still had the old saying “One teat for the farmer, one for the calf” running in my head. What happened to that?? What happened to sharing the milk? The Masai of Kenya live off of cow’s blood and milk and the calves live with their mothers and they all live long, healthy lives. Other tribes and people that live with their animals don’t separate the calves and cows. Why doesn’t it work that way here? Well, can’t you separate the calves during the day, and just let them be with mum at night? Then I went and talked to a raw milk farmer – whose cows are out on pasture. If you’ve read any of the posts on raw milk here on my blog, you’ll know that these cows must be kept really healthy for the milk to pass the frequent testing (which is much more stringent than the testing for pasteurized milk). The raw milk farmer told me that he leaves the calves with the mother for about a week or so and then they are separated. The calves are fed raw milk. The females become milk cows and the males are grass-fed until they are slaughtered for beef. He said his milk cows live about 20 years. I know most people’s solution to this horrific practice is to stop consuming dairy. That’s one solution. But how about the billions of people worldwide who will never give up their cheese, or cream in their coffee, or whey protein shakes? I always teach my kids that whatever you pay for, you are supporting. WE are the one keeping these practices going, we are the enslaver, we are the ones ripping the baby away from the mother. So I would gladly pay 2 or 3 times the price to purchase dairy where the calf is left with the mother for… I don’t know… I have no experience with cows or their growth etc. but I would guess… at least 3-4 months? I remember when organic food was considered ridiculous. I was mocked by everyone including family members for paying ‘outrageous prices’ to support the organic food movement. 20 years later, guess what? Yep. Every single one of those nay-sayers is regularly buying and eating organic food. I believe dairy needs to follow the same path. I have not even looked into how goats or sheep are treated when farmed for their milk. But as a mother who has given birth 3 times, I cannot imagine the horror of having your baby taken moments after birth and then your breasts pumped incessantly for their milk until you die when you’ve reached 1/5 of your normal lifespan. So for a human, that would be what… you birth your first baby at age 12 or 13 and you’re dead by 16? I would like to start a conversation – not about the horror – but about practical solutions to dairy farming that take the mother’s soul into account. I know I must have some readers that farm, or know dairy farmers… can we please start a dialogue of ideas, problems, experiments, possible solutions, in the Comments section below? Are there any small raw milk farmers who are currently leaving the calves with the mother and harvesting a humane, sustainable amount of milk? Solutions – YES there IS a better way! So there we have it – two commercial dairy farmers, on separate continents, harvesting milk in a humane, loving way. “The cow belongs to my friend who takes general responsibility for the cow… vet visits and bills, living arrangements, feed, etc. The other families that “rent” the cow contribute monetarily, donating whenever possible – about the amount that we have calculated would be needed to maintain the cow for that day. 1. I have been there for the birth of two calves. The calves were allowed to stay with mom for about 3 months. 2. Weaning at 3 months was my friend’s choice, since they are her animals. I got the feeling that it just became too much of a hassle to keep the calf on past that point. She sold the calves since they were both males, and she is trying to get a female to replace her cow. The calves were big enough by 2 or 3 months to make separating them from mom and cleaning the pen at milking time a little challenging sometimes. Sarah also mentioned that she thought the calf was contributing to the cow developing mastitis, as it preferred to only drink from certain quarters. After the calf is gone, the milk is creamier, and there’s much more of it! 3. When we weaned the calves they went into a pen adjacent to the cow for about another month before going to their new homes. They were fed formula and grass. 4. The cow has been impregnated every year since I have been milking. I don’t know what my friend will choose to do once she gets her female calf. She does live breeding with a miniature bull because she wants a smaller cow next time, and also I think to minimize risk of injury to her current cow. 5. As far as I know, the cow has not been given a “rest year”, although we do stop milking for the last few months of the pregnancy and for the first few weeks after birth. 6. As I said above, I have been doing this for about 2 years. My friend bought the cow from a dairy when the cow was a couple years old, and has been sharing the milking with other families for 4 or 5 years. It’s my friend’s first cow, so I can’t really give you lifespan information. As far as health problems, the only thing I have seen and dealt with is a few bouts of mastitis. One of the cow’s teats was damaged by the milking machines during her time at the dairy, and that is usually the only quarter that becomes infected. During the treatments for mastitis, we still milk the cow, but discard the milk. What we can do is to SHARE these stories with other people and especially with dairy farmers. Most probably do not even know this is possible! ← Is Fish Healthier Than Beef or Chicken? My friend owns a large jersey cow, and she lets us and several other families “rent” the cow each time we milk her…to bypass laws against selling raw milk, I suppose. Anyway, she allows the calf to stay with mom full-time for about 3 months. During that time, we still milked every evening, getting around 1 1/2-2 gal. of milk that the calf wasn’t drinking. Around 3 months the calf was removed from mom’s pen. The cow was a little agitated for a couple of days, but did continue to produce well. We went to twice a day milkings, and are now getting around 3-4 gal. a milking. We only milk twice a week, and have enough to drink, make yogurt, butter and cheese, and share with the neighbors! This one happy cow is currently producing enough milk to support 7+ families demands for milk. It’s not mass production, but it shows how neighbors and people can band together to help each other and do this in a sustainable, humane way. FYI, with the calf previous to this one, we experimented with allowing the calf to be with mom all night, then putting it in a separate pen (next to mom, but unable to milk) during the day. We got more from the evening milking this way, but we also dealt with more cases of mastitis. I think it is healthier for cow and calf to be together longer. Thanks so much for taking the time to write in and share your experiences! I am most grateful to you for bringing these terrible truths to the attention of your readership. 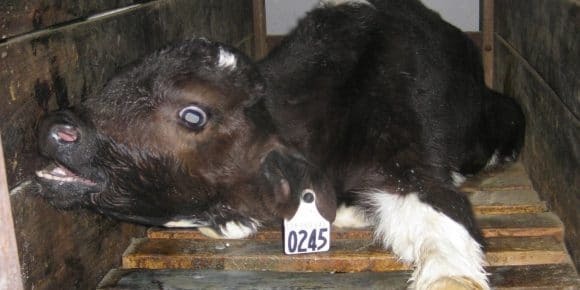 The suffering that takes place in the meat and dairy industries are horrific and ongoing and the only way to address them is for the consumer to make up his or her mind not to support these activities. There are many hidden truths buried under a avalanche of lies and deceit that make up the food, medical/health care and pharmaceutical industry, all in all of which I refer to as “The Medical Matrix”. It is so pervasive in our lives yet so little understood. Bringing these ugly truths to the surface is difficult as few people want to hear the facts and are often angry when they are brought face to face with them. I know from the past 30 years of showing films of this type to my Clinical Nutrition Classes I often have to contend with anger, tears, confusion and disbelief from students (and patients) which is difficult to deal with. It is not too much different than when working with patients and trying to dismantle their beliefs about addressing causes as opposed to endless medical treatments and therapies of all kinds. Old mind sets can be difficult to break. Many Kudos to you for bringing these important facts to light! Marie that is such AWESOME info!! And so helpful!!!!!!! Right there you have given all of us a blueprint for how it can be done. How did you make the decision to wean at 3 months – and not 4, or 6 months, for example? I would LOVE to do a blog post about what your group is doing – do you or your friend have any photos? I’m going to email you directly about this – see if we can put something together to show other people/farmers how this can be done. Just fabulous! I stopped eating anything from a Cow and wow I am glad I did! More because I had leukemia and I learned about the GMO’s blocking our bodies normal cancer fighting pathways. Since cows are fed GMO grains I stopped consuming Cow. Poor Cows. I am allergic to cow’s milk and I have found it a blessing in my life at every turn. However, this video almost made me cry. What we do to animals is given rise to a society that cares not where its food comes from or what animals have been abused in the process. This is where man has truly lost his humanity, if he ever had it. Thank you for your response. We completely agree as well. It is heartbreaking to see what is done to some animal just for humans to get food and drinks. After seeing this myself it made me grateful I too am lactose intolerant and have not had milk in years. We hope that getting more awareness on this can hopefully help in a small way of this happening less by people being aware of this behavior towards animals for milk and food. I thought you might be interested in reading the story in this book about how dairy cows apparently were handled in the 1870’s. This was June and South Dakota, so I am thinking the calf must have been two or three months old. At that point, the cows was milked, the cream was removed, and the calf learned to drink some of the skim milk out of a bucket. It doesn’t really say whether the calf was wholly kept away from the mother during this process though. You can read the story just on the Kindle preview – you don’t have to actually buy the book. Oh my gosh, I read this entire Little House on The Prarie series as a child – obviously this is where I got my assumptions for how dairy cows share the milk with calf and farmer! Although, it says the calf was given a share of the fresh, whole milk and then the skimmed milk from the previous day’s cream harvest was also added to the calves pail. Then the calf and the yearling were staked on grass. So it doesn’t look like the calf was allowed to be with the mother (at least during the day, or that time of day). Would sure be interesting to hear from some farmers now in their 90’s or 100’s how it was done in their day! Or even third-world countries. Clearly more research is needed! Thanks for this piece though – and for the blast from the past where I SO loved these books! “…In Devil in the Milk, Keith Woodford brings together the evidence published in more than 100 scientific papers. He examines the population studies that look at the link between consumption of A1 milk and the incidence of heart disease and Type 1 diabetes; he explains the science that underpins the A1/A2 hypothesis; and he examines the research undertaken with animals and humans. The evidence is compelling: We should be switching to A2 milk. Up until this summer, we had milk goats for our consumption and others in the neighborhood. It is such a wonderful experience! When it is time for the goats to give birth, I assist or sometimes just watch the miracle that it is. We are hands on from the first minute and the ‘kids’ love us. I keep the goats with the mother until 3-4 days old, then remove at night to a warmer bed because they are usually born when it is cold. I milk the mom in the morning, feed the ‘kids’with some of that milk,and return the ‘kids’ to their mom after that for the day. They are well fed and grow fast and very connected to me, our children and their mom, because we feed them too. We live in a neighborhood on two acres, with a big organic garden, orchard, vineyard and berries. We love our animals, chickens, cats and dog and we feel like we all contribute to each other’s health and wellbeing. Even the neighborhood kids have learned to milk, and care for all the animals as well as assist in birthing when old enough. The neighborhood kids can hardly wait until they are 8 so they can learn to milk. I think you learn to love and nurture on another level when you care for animals and the land that feeds you. I found this today and was shocked (in a good way)! Remembered reading your article here so I thought I’d better come back and share with you guys. I am determined to either find a place like this near me or adopt a cow or a couple of goats and get my own milk. I love milk and I intend to keep drinking it but I’m not okay with causing unnecessary suffering. It is so do-ble to raise animals humanely, partake of what they have to offer: either milk or eggs, clean manure for gardens and orchard, AND bug and weed eaters! They also teach responsibility for children to learn how to work! Our grandchildren and many children in our neighborhood have had sole responsibility over animals and gardens while we are away, and done an amazing job! It is a joy to have animals that become love family members, and to learn about coping with a passing of a beloved pet. If you have the land and the means and desire to keep farm animals, your life and dinner table will be richly blessed! OMG Stephanie, that farm is awesome! Funnily enough, this very same week I too have FINALLY found a larger-scale dairy that allows the calves to remain with their mums for 9 months! The cows do not even need to be restrained during milking and come in to be hooked up to the milking machine when their names are called! I noticed the same thing in the link you provided to the farm in Indiana; the calves wait outside the milking parlour twice a day until the mothers come out again. And yes, there is enough milk for calf and human! I would love to do a teleseminar with one or both of these farm owners so we could have a resource for other farmers on all the nitty-gritty details of how to run a dairy this way, the financial implications, practical considerations, etc. A teleseminar would be awesome! I wish I could find a farm near me that worked this way. I would buy all my dairy stuff from them. And I have added the information on the 2 dairy farms who leave calves with the mothers during milking, to the post above. Yay! Finally, some solutions to share with others. THANK YOU all for reaching out. Thanks for posting your concern and desire for humane solutions to getting animal milk for humans. I’ve been vegan for about 15 months. I have not missed dairy although these store bought substitute vegan cheeses just don’t have the flavor and texture of what I grew to love eating cheese all my life. Currently I have adopted creating my own sour cheese or cream by soaking and blending nuts and then culturing them with a couple table spoons of vegan yogurt or home made rejuvilac which has many recipes on you tube. I have grown to deplore the commercial human intervention between mother and baby for taste or profit but the idea of sharing the milk, like the Masai, seems favorable if you have the resources to create such a relationship. Hi Mark, glad that’s working for you. Personally I find the taste of some of the vegan cheeses not bad, but I can only have a little bit, otherwise my body doesn’t like it. My kids drink a lot of raw milk though, so I wanted to have some information/ideas to start a dialogue with our raw milk farmer. If you ever have a recipe for vegan cheese that you LOVE, please post it here for us! All this contrary information on Raw Milk, Colostrum and IGF-1 is so frustrating to me. What do you think about this IGF-1 fiasco? Would you consume Raw Milk and Colostrum on a daily basis? The best thing about raw milk, cow milk or goat, is the good bacteria that comes with it. Milk has its own powerful bacteria that keeps other bacteria from growing. When milk is pasteurized, this good bacteria, along with bad bacteria is killed. So now you have a product that is prone to bacteria left without its own natural defenses. You have now created a food that is open to any bacteria that is in the air or bottle, or bottling equipment. A hazardous product that wreaks havoc on a human body that may not contain enough of its own good bacteria to fight this toxic intruder. It is a tragedy that such a nutritious food, has been so corrupted as to be considered harmful. No wonder we are developing awful disease at a younger and younger age. Why don’t we take this raw milk that is full of nutrients, and instead of destroying it, turn it into a SUPERFOOD! Milk Kefir is that food. With all the benefits of whole raw milk PLUS it is fermented to grow beneficial bacteria that our systems need for digestion! It has more good bacteria than yogurt, fermented vegetables, kombucha, raw vinager, or any other fermented food. Not only do you get vitamins, minerals, protein from the milk, but you can create beneficial bacteria for your gut! One of the most important things for good digestion! Everything on this earth is for our benefit. We have dominion on the earth and all living things on this earth are here for our use. With dominion comes a sacred responsibility to use the earths’ bounty with respect and prudence. Hi Tobias, I don’t tolerate dairy, but my kids drink raw milk daily. Interesting info about colostrum – I have only bought from sources that harvest colostrum in the most humane manner possible and I’ve been testing it on my cats and horses. My injured/sick cat showed no improvement over 30 days, but it wasn’t a test of whether she “wanted” it or not, as it was a flavored product. Out of my 5 horses (one of whom is nursing) only 1 liked it. They actually left everything in their bowl (their normal vit/min supplement which they like and flax seed, etc) rather than consume it. The one who ate it, took about 4 doses and then refused it. Weirdly, the bottle I bought for human consumption/testing, I have not touched. So whether I am just not energetically “drawn” to it, or whether my body is signalling me that it is not a good thing to consume, I don’t know. I haven’t done, nor seen any research on this issue – other than the video link you gave. But I will keep my eye out and if I come across anything, I will post it here. Thanks! A better solution is needed. I don’t really tolerate dairy but we buy dairy beef from an organic, 100% grass fed and dairy farm that raises their calves until 18 months – 2 years old. Yes, I struggle with the ethical and environmental implications of eating meat however I am happy to support this model of farming. Yes Cara, the more of us ‘vote with our wallet’ the more we can create pressure and demand for more humane treatment of animals. A good way to check if something is ‘humane’ or not, is to imagine yourself in that exact situation. If I was a cow being raised for meat, would I want to be outside, or indoors? Is 2 years enough for me to experience life, before returning to spirit? and so on. Jini, Just wondering if you have looked into how you source your whey protein for the Absorb drinks? Thanks for contacting us here. Click here to learn more about the Protein source in Absorb Plus.